We have a habit of hitting “Remember me” button when the browser prompts asking for it, which is definitely an ease login method, thanks to all the browsers. Almost every browser has this feature. Generally, we used to have a lot of accounts so there is a possibility to forgot some of them. But forgetting your password can be embarrassing and frustrating at times. And when we like to change the password or use it somewhere else to create an account. Then actually we realize we don’t even remember our password as we have a habit of saving it on browser and auto login. In such case, most of the people use to reset their account and create a new password as they can not view the password. Because our password is being hidden behind the asterisk key (***), which is done by the browser for the account security. But to get back and view the password behind the asterisks into an actual one, there is a better way. 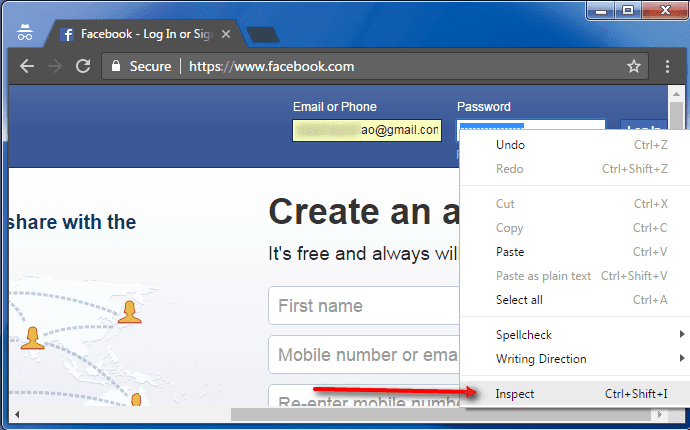 Here we are going to check out on a Facebook login, but the process would be same for all. Following few simple steps below can show hidden password and can be a password revealer, you don’t have to search on the web for any kind of third party application as show password tool, as asterisks for windows can do the job!! 1. Make a selection of the asterisks and right-click, and then select Inspect Element which will take you to the source code. Where you will be accessing the HTML and CSS codes. 2. It would be shown in the below image, double click on the password and you would be able to edit it. 3. Once hitting the “Enter” button, you would be able to see the password now.